Your 11th house continues to be powerful this month and you are in a very social period, both romantically and with friends, groups and organizations. Power in the 11th house shows an interest in science and technology. Your knowledge will increase in both these areas. New computers, gadgets and software will come to you and you seem more active online than usual. A parent or parent figure is in a yearly financial peak (since June 21). 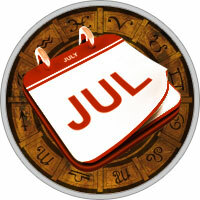 There is prosperity for the rest of the year too, but this month it is especially strong. He or she needs to be more careful on the physical plane until the 18th. Review the comments from last month. Virgos are rational, logical people. However, the Water element is strong in the Horoscope this month, with up to 70 per cent of the planets either in water signs or moving through them. People are feeling based these days: logic and rationality count for nothing. It is the mood of the moment, the sentiment, that carries the day. This is what matters. If I feel that the earth is flat, then that's how it is for me! This is a little hard to deal with. Yet at times like this, the world needs more Virgo rationality. You are very impor­tant these days. On the other hand, this is a good period to get more in touch with your feelings. Virgos, more than most, can live in the mind and thus miss out on an impor­tant dimension of themselves. This is a very good period for making psychological progress. Love is very good this month. Singles seem to have a choice between committed, serious relationships or mere love affairs. Both offer themselves to you. Fertility is still very strong now (for those of you of childbearing age). Romantic opportunities happen in the online world, through social networking sites, online dating services, and through friends who play matchmaker. Romantic opportuni­ties also happen as you get involved in groups, group activi­ties and professional or social organizations. Finances are good this month and there is prosperity. Until the 23rd, your financial planet is in your spiritual 12th house. Thus the spiritual dimensions of wealth are impor­tant. Intuition - inner guidance - is important. On the 23rd, Venus moves into your own sign. This brings financial wind­falls and opportunity. Financial opportunities will seek you out. With most of the planets now in the independent Eastern sector and your financial planet in your own sign, prosperity is up to you - it is in your hands. You know best what needs to be done. Shape the financial life (and the other circumstances of your life) according to your specifica­tions. With Venus in your own sign, you tend to spend on yourself, on your body and image. This is a good time for this, as the aesthetic sense is good. If you need to borrow or negotiate a mortgage, between the 19th and the 24th is a good time.